The Fantasy Real Estate Agency - which uses "historical /heritage sites which are often forgotten or abandoned, once sacred places, in ruins from colonial times or the subject of local myths. 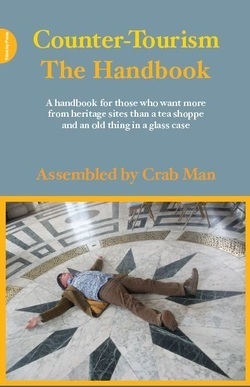 The aim is to explore those places and make some action/performance in terms of discovering tactics for 'counter tourism’... a term coined by writer and performer Crab Man, and described as a series of 'tactics (which) are designed to transform the way you look at places and to get you thinking about the way the industry packages 'heritage'." "This is a brilliant idea! I have often thought, while dragging around some National Trust house, 'What am I doing here, what am I looking at? Is going to stuff like this just performing some kind of ritual?'" "My students really need to read thisbook! And it's always good to have some performative strategies to enliven our field trips. Thanks..."
"I have been perusing your site and I think we have some interests in common. You might like to look at my Pavement Graffiti blog, and in particular the post with a photo of a pedestrian whose utterances have been censored: http://www.meganix.net/pavement/2010/11/08/expletive-deleted/"